Discussion in 'Intake Systems , Fuel Systems and Related' started by grumpyvette, Mar 30, 2015. Here's our nearly complete '60 Rochester fuel injection unit, looking good as new. This view shows off the air meter side of the unit, which is the part of the system we'll be focusing on in this installment. This simplified diagram shows the basic function of the air meter. Air passing through the intake creates a vacuum. 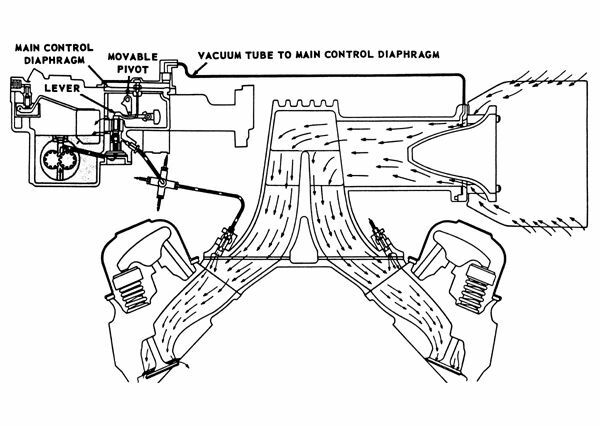 This vacuum passes through a tube to the main control diaphragm, which adjusts the moveable pivot and lever system, and allows the correct amount of fuel to be fed to the injectors. In this view of the air meter, Rochester expert Chuck Smith has slid the throttle valve shaft into place and inserted the butterfly valve in its proper position. ...which is .003-inch, as measured with a feeler gauge. The idle speed screw is then replaced. Chuck screws it in all the way before backing it out two full turns. This gets you in the ballpark, but the final adjustment will have to wait until the completed unit is back on the car. The air/fuel ratio screw is backed out two turns from fully seated. As with the idle speed screw, final adjustment will have to wait until the unit is replaced. At this point, the air meter can be bolted onto the intake manifold (aka the "doghouse"), using the proper gasket (arrow), of course. The air diffuser is then screwed to the air meter. This cone creates a venturi effect, which in turn creates the vacuum signals that control the Rochester F.I. fuel meter system. Note the O-ring on the meter (arrow), which needs to be fully seated in its groove. Our next step is to reassemble and reinstall the choke unit. As you can see in this diagram, the enrichment vacuum tube passes through the choke. During cold starts, the choke cuts off the vacuum from the air meter with a check ball. This puts the fuel enrichment diaphragm in a "more fuel" position. As the choke thermostat heats up, the check ball allows vacuum to pass through, returning the system to normal operation. ...which is tapped into place with a hammer and a small drift. The other, larger signal control valve and its spring are helped in place with a brass cap. The choke housing is then screwed into place on the air meter, again using the proper gasket. After a thorough cleaning, the original electric choke unit itself is then replaced. It's especially important to make sure that the lever (arrow) is free of corrosion. In this shot, our choke assembly is nearly complete. The electric choke unit has been screwed into its housing, with its ground wire in place (1). The pivot assembly has been installed onto the choke (2), while the choke "cam" has been screwed to the air meter (3). The rod that connects them is in place (4), and the choke idle screw has been replaced (5). Chuck sets the screw to contact the low spot in the cam; final adjustment will have to be made when this unit is installed. He then sets the adjustment on the choke unit itself at 1-1/2 notches "rich," or counterclockwise. At this point, the air meter is almost complete, and it's time to move on to the injector assemblies. 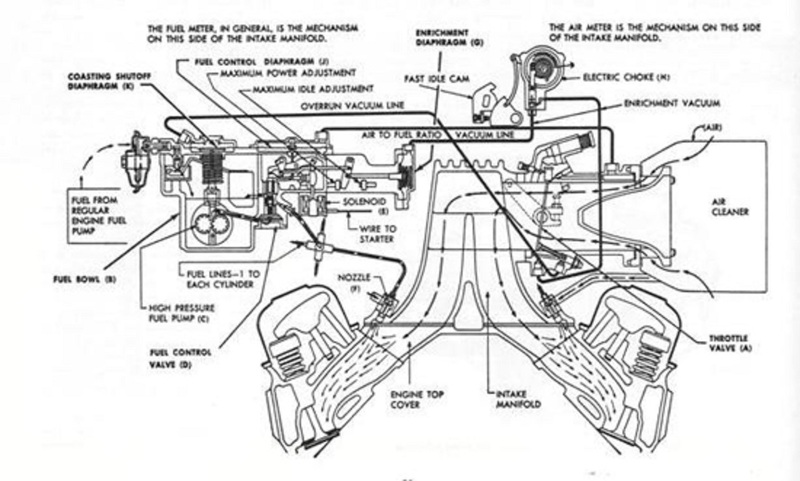 The injector nozzle consists of, from left to right, the nozzle head, a nozzle disc (which allows the proper amount of fuel to enter the nozzle), a nozzle screen to help keep the disc clean (the correct side must be facing down or fuel won't flow), and the nozzle body. Chuck makes sure each nozzle assembly is working properly by spraying carb cleaner through it. Parts are replaced as necessary. Every nozzle head is fitted with a small O-ring before being inserted into the nozzle block. The nozzle assemblies are run through the block and into these brass fittings (arrow), which correspond to the holes in the intake manfold. The bolt holds the block to the manifold, while the small metal place holds the injectors in place. Chuck then flips our Fuelie unit over to install the fuel lines, commonly known as "The Spider." Here, he's fitted the center of the Spider into its rubber grommet and made sure that the lines clear the throttle linkage. Each line is then connected to its corresponding injector block. These lines look just as they should. According to Chuck, several of the lines had been bent closer to the doghouse in a misguided attempt to make the system look better. He carefully bent them back to their proper position. 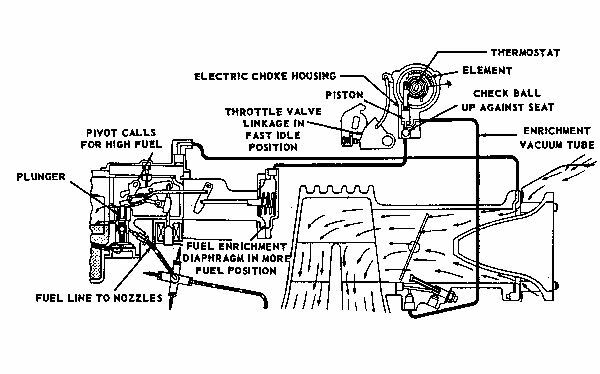 The main fuel line (arrow) is then installed, allowing go-go juice to flow from the fuel meter to the Spider. Coming into the home stretch, it's time to connect the air meter and the fuel system. The "H" shaped system of metal tubes and rubber hoses allow vacuum from the air meter to reach the injector nozzles, which helps the fuel to atomize. In this photo, the vacuum tube to the main control diaphragm has been installed. Chuck is fastening one end to the air meter; he's pointing at the other end, which attaches to the T-fitting atop the fuel meter, with a screwdriver. ...and connect to the appropriate fitting on the choke housing (arrow). The remainder of the throttle linkage is then installed. The throttle linkage bell crank is held onto its shaft with a cotter pin (behind the throttle spring); the throttle rod bolts to the linkage on one end and the throttle valve linkage on the other. This fitting is then replaced onto the doghouse; it won't be reconnected until the unit is back in the car. After putting the intake manifold gaskets in place, Chuck reunites the fuel injection unit and the manifold. And finally, the ballast tube is routed across the front of our great-looking and almost-ready-to-go Rochester fuel injection unit. In Part Three, we'll finish up with two critical, but often overlooked components: the Rochester system's high-pressure fuel pump and the unique distributor that drives it. See you then! 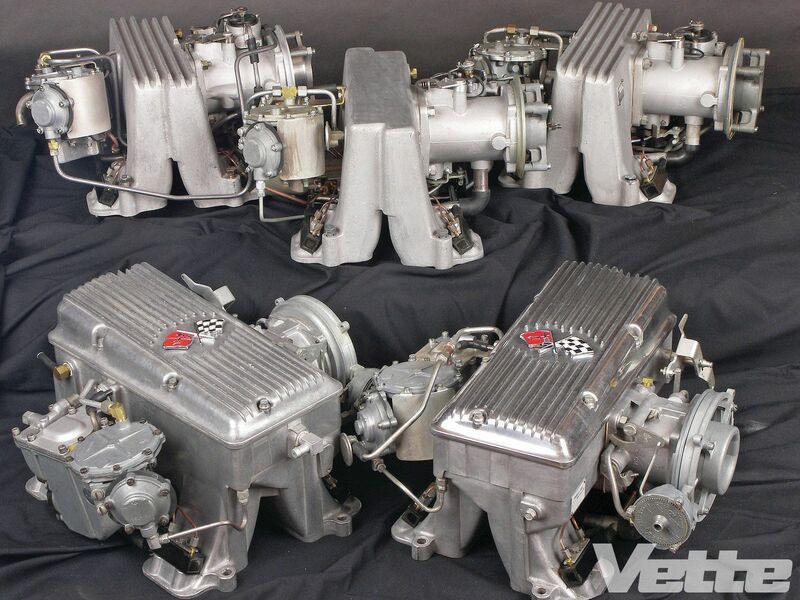 In Part One, we extolled the virtues The Chevrolet Ramjet Fuel Injection System, which is being reproduced by Corvette America. (Route 322, Box 427, Dept. VM, Boalsburg, PA 16827; 800/458-3475, www.corvetteamerica.com). In preparing to write Part Two of "Rochester Rx" I referred to this pamphlet again and again to make sure I understood how the unique system works. Each subsystem is explained in detail, and the line drawings are top-notch; several have been used in this story. It's fascinating and useful reading, for the do-it-yourselfer the merely curious, and for those seeking to know everything about vintage Corvettes. Like we said before, when it comes to taking care of a Rochester F.I. system, you can't have too much information. I tried for a long time to get this to work off idle - no go, yet. You have info I never seen before. Thanks Grumpy.